On Tuesday, 27 April at 19:00 artist and historian Terence Gower (1965) gave an illustrated talk on Joseph Hirshhorn’s projects for the Washington museum that bears his name and for the construction of a town to be called “Hirshhorn, Ontario” in Canada. The lecture is supported by the Embassy of the US in Latvia and it is part of the US culture month “Made in the USA” programme. Joseph Herman Hirshhorn (1899 – 1981) was an entrepreneur, financier and art collector. Born in Jelgava, Latvia, the twelfth of thirteen children, Hirshhorn emigrated to the United States with his widowed mother at the age of six. His fortune was built on the 1953 discovery of the largest cache of uranium in North America in western Ontario. When Hirshhorn began to make money, he began to buy art, both paintings and sculpture. His collection consisted of around 12000 artworks by many renowned artists of the the nineteenth and twentieth centuries such as Willem de Kooning, Raphael Soyer, Jackson Pollock, Larry Rivers, Louis le Brocquy, Thomas Eakins, Auguste Rodin, Pablo Picasso, Henri Matisse, Alberto Giacometti, Alexander Calder and Henry Moore. 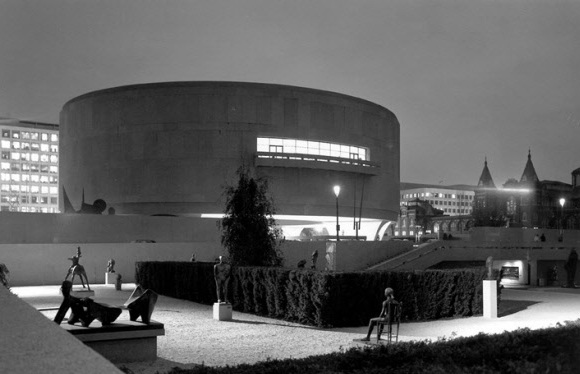 In 1966, Hirshhorn donated much of his collection to the United States government. The Smithsonian Institution established the Joseph H. Hirshhorn Museum and Sculpture Garden in Washington, D.C. to hold the collection. At Hirshhorn’s death in 1981, he willed the rest of his collection. After discovering the cache of uranium in Ontario, he enlisted architect Philip Johnson to help plan and erect what he envisioned as a “city of culture” – Hirshhorn. It was to embrace the latest urban planning strategies of the day and be anchored by a ten-story tower that would house the administration of the mining interest. Joseph Hirshhorn also imagined his massive art collection as the centerpiece of a Utopian mining town. A mean streak of protectionism from the nearby communities saw to it that Hirshhorn was never built. Though the city in the wilderness was not to be, a correspondence with President and Ladybird Johnson encouraged Hirshhorn to bring his collection of modern art to Washington DC. Terence Gower is a New York-based artist who works on representational strategies in twentieth century architecture. He has exhibited his work in galleries and museums in the US (Hirshhorn Museum, Washington; New Museum, Storefront for Art and Architecture, Queens Museum, and PS1 Contemporary Art Center, New York; ICA Boston; UCLA Hammer Museum, LA; and ICA Philadelphia), Mexico City (La Colección Jumex; Galería Arte Mexicano; Laboratorio Arte Alameda), Canada (The Power Plant, Toronto; Gallery 101, Ottawa; Artspeak, Vancouver), Germany (Kunsthistorisches Institut, Bonn; Galerie für Zeitgenössische Kunst, Leipzig; Galerie M+R Fricke, Berlin), and Latin America (XI Mostra da Gravura, Curitiba, Brazil; and Centro Recoleta, Buenos Aires). Gower’s videos have screened at festivals and museums in Barcelona, Madrid, Buenos Aires, Florence, Mexico City and New York. Gower has curated exhibitions and screenings for several museums and art centres such as New Museum, New York and Hammer Museum, LA (Modern Shorts), Museo de Arte Carrillo Gil, Mexico City (Public Practice / Private Lives), El Museo del Barrio, New York (The Conceptual Trend), and el Museo de la Ciudad de Mexico (Pasaje Iturbide). Two monographs were recently published on Gower’s work: Ciudad Moderna: Terence Gower Videos (A&R/Turner, Mexico City), and Display Architecture, about Gower’s pavilion projects (Navado Press, Berlin).